Solar panels “download” the sun’s energy. It uses the same melted salt for the life of the power plant and receives a lifetime of energy from our greatest source of power—The Sun! 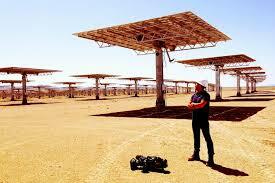 July 16, 2014— Can solar energy be stored? Yes! 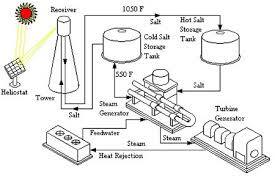 The first use of solar thermal energy equipment technology, that was recorded, was developed in the Sahara Desert in about 1910, where a steam engine was powered using a mirror system for sunlight. The sunlight heated water, turning it into steam. But during WWI further development was abandoned because oil was abundant, and easily obtained. Today, Solar Thermal Energy (STE) is being harnessed for the world’s largest solar plant which uses molten salt for storage—the Crescent Dunes Solar Plant in Nevada. Here’s how it works: A series of mirrors (heliostats) track the sun on two axes, concentrating the solar radiation on a receiver in the upper part of the tower where the heat is transferred to the molten salts. Molten salt is a perfect heat capture source, as it maintains its liquid state even above 1,000 degrees Fahrenheit. The sunlight heats up the salts and puts the molten salts in proximity to water via a heat exchanger–creating steam. The hot steam can then be made to turn turbines without losing much of the original absorbed solar energy. The salt is then piped back into another storage tank, where it is cooled and reheated later for the same process. Water is also recycled, as it travels back to a water holding tank where it will stay until needed again. The Crescent Dunes solar plant can store the sun’s energy to use during night or cloudy days. This process uses the stored solar to generate reliable, uninterrupted electricity to homes during the night or on cloudy days when direct solar power isn’t available or during peak demand hours when extra power is necessary. There is zero emissions or waste with the use of Solar Thermal Energy. It uses the same melted salt for the life of the plant and receives a lifetime of energy from our greatest power source—The Sun! Solar energy avoids greenhouse gas emissions produced by a fossil-fueled power plant. Another step towards creating a healthy planet! Categories: Climate Change, Energy Programs, Renewable Resources, Solar | Tags: crescent dunes power plant, Molten Salt Storage, Renewable Resources, Solar power, Solar Power Plants | Permalink.